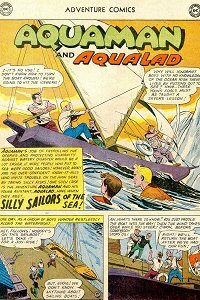 Adventure #279 (Dec 1960) - Silly Sailors of the Sea! A group of four teens take a sailboat for a joyride and Aquaman makes sure they don't do it again. Quotefile: "What shall I do? I don't know much about sailing boats! I never thought it could be so dangerous!" Finny Friends Report: Aquaman has the fish swim in a circle to cause a whirlpool. Other sea creatures hold up figureheads to create sea serpents. A school of whales causes waves, squids shoot ink into the air, and electric eels supply lightning to create an artificial storm to scare the boys. Lastly, whale raise an old ship while octopi and other fish help Aquaman and Aqualad arrange dummies to look like pirates. A remarkably silly story. Why is Aquaman so intent on teaching the boys a lesson? Seriously, just bring them in instead of putting them through greater dangers. Maybe Aquaman secretly wants them to have a great time at sea? In any case, it gives Aquaman a chance to dress up as a pirate, so it's clearly a good thing. 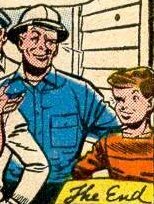 Notice the final panel and the wink between Aqualad and Mr Hale. A fun little moment for the kid. One last note. The final page also says, "A 3-part AQUAMAN novel, including "The Origin of Aquaman" will appear in SHOWCASE #30, on sale Nov. 24!" That will be the start of Aquaman's four-issue run in Showcase, a test run for his first solo series. At the same time, he will appear in Adventure Comics three more times, then switch to being a backup in Detective Comics for a memorable 8 issue run that will conclude after the first issue of his new series starts up. In addition, as if that weren't enough, he'll start appearing as a backup in World's Finest once his run in Detective is done, with a total of 12 stories there that come out at the same time as his solo series ramps up. I'll be tackling these stories in roughly chronological order, although I'm certain to not get it exactly correct.